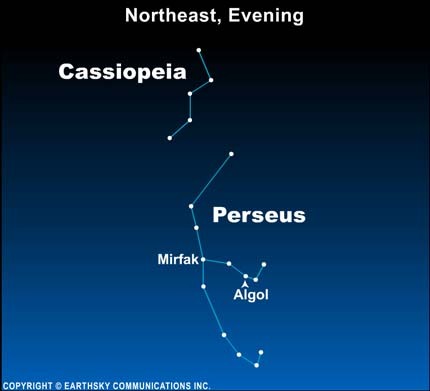 As Halloween approaches, try looking for the star Beta Persei, otherwise known as Algol in the constellation Perseus. This star’s proper name comes from the Arabic for head of the ghoul, or head of the demon. This star is known to vary in brightness over a regular time interval. The cycle lasts exactly 2 days, 20 hours and 49 minutes. All the while, the star remains visible to the eye. Algol’s brightness variations are not due to some special quality of a single star. In fact, this is a multiple star system, where one star regularly passes in front of another as seen from our earthly perspective. Early stargazers had no way to know why Algol varied in brightness. 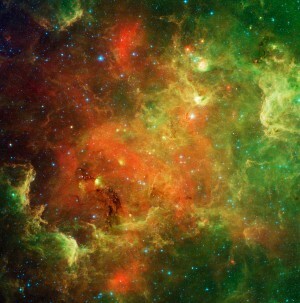 Nevertheless, it is likely that they did notice this star’s brightness change. Throughout parts of the ancient world, Algol was associated with demons or monsters. The Greeks and Romans identified the star with the Head of Medusa, a fearful monster with snakes in place of hair. The star has also been called The Ghoul Star.